Back in November, I posted about the creation process for my print, Gruff, that I contributed to the Midwest GBW print exchange project. 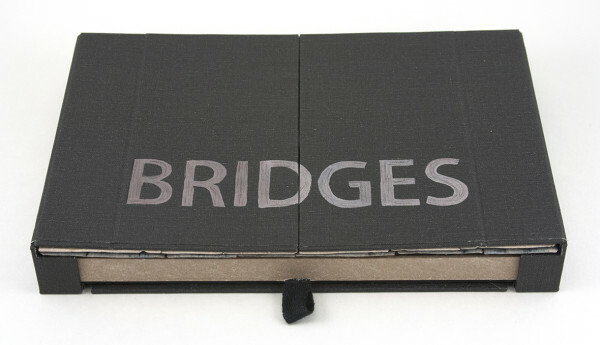 The only requirement was that the print had to fit in with the theme “Bridges”. Soon after I mailed my print to join the other submissions, I received my group of prints. 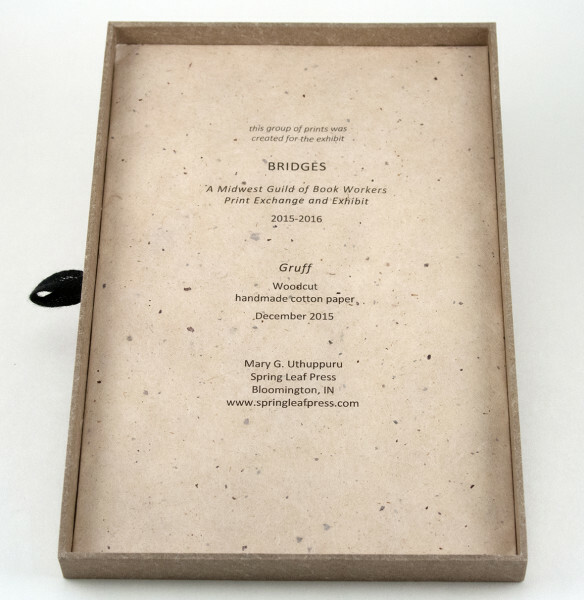 The second component of the print exchange was to create a box or a binding to house the prints that would then be included in the Bridges exhibit in Davenport, Iowa. 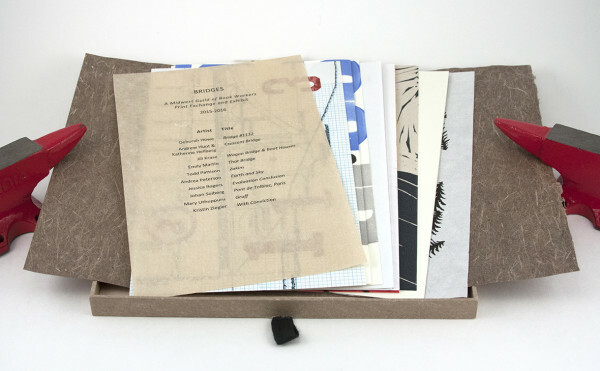 I decided to create a box for the suite of prints as it would be a good way to compile the prints of different sizes. Plus, I love making boxes! The bridge theme would play into my enclosure in a very literal way. 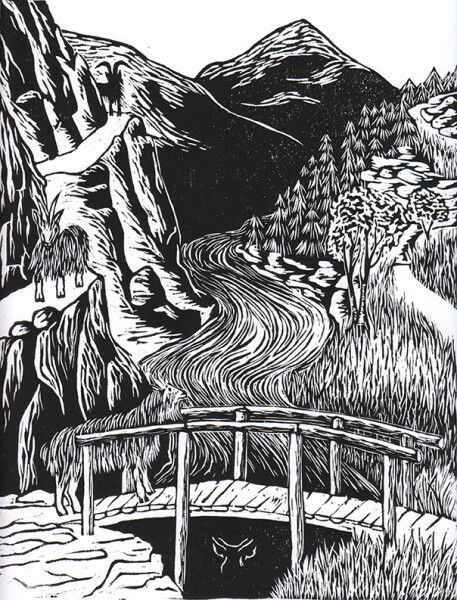 Instead of trying to come up with a bridge that would describe all of the prints included, I decided to represent the bridge that is featured in my print. After much thinking and testing potential structures, what I settled on is essentially a slipcase on its side that pops-up and has a drawer. The photos below will help illustrate this. 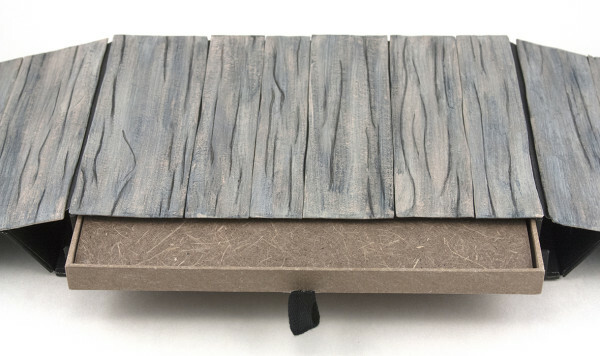 The title was stenciled across the two flaps that serve as the top of the box with a few marks that suggest grainy wood. Opening the two flaps activates the bridge mechanism. When the flaps are opened completely, hinged pieces pop the box up, creating the bridge. To keep the prints secure during any trips the box may take, I added a chemise, from a sheet of Indiana Corn (from Hook Pottery Paper). 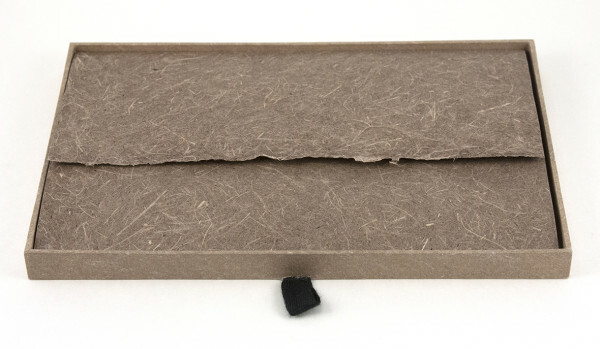 This is a strong handmade paper that not only reinforced my theme but would minimize wear during movement. Upon opening the chemise, the title page (including artist names and titles) and the prints are available for easy viewing. Finally, the colophon for the print was glued into the floor of the drawer. Overall, I am very pleased with the outcome of this box. The pop up mechanism functions well and it reinforces the theme of the exhibit (bridges) as well as the theme of my print in particular “bridge and what is underneath it”. I look forward to playing more with enclosures that have movable components.